For 25 bucks a year, the new EA Sports Season Ticket program offers subscribers early access to games, DLC discounts, free content and more - but be sure to check the fine print before you sign up. Electronic Arts took the wraps off the new Season Ticket program today, a subscription-based service that offers gamers "premium benefits for a better gaming experience" on five EA Sports franchises. The upcoming Madden NFL 12 will be the first game to incorporate Season Ticket, followed by releases in the NHL Hockey, FIFA Soccer, Tiger Woods PGA Tour and NCAA Football series. For 25 greenbacks per annum, fans will get "full-game digital access" to new releases, allowing them to download and play the full versions of new games three days before their scheduled release on the Xbox 360 and PlayStation 3. The ticket price also includes a 20 percent discount on all DLC, free access to "premium web content" starting with the Creation Center packs for FIFA 12 and an "exclusive membership recognition badge" that will appear on subscribers' profiles. So what's the catch? The early access to new releases expires once the game in question hits retail, at which point you'll have to pay full pop if you want to keep playing. And in order to access a game's Season Ticket content, you'll have to register its Online Pass - in other words, preowned copies do not qualify. It's tempting to dismiss Season Ticket as just another EA cash-grab but I don't see the aforementioned requirements as particularly onerous and EA isn't holding previously-free content for ransom. But I do wonder if there are really that many die-hard EA Sports fans out there; there are lots of fans of specific franchises, obviously, but is there enough crossover between, say, the NFL, NHL and PGA franchises to warrant a program like this? EA Sports Season Ticket is only available on the Xbox 360 and PlayStation 3. 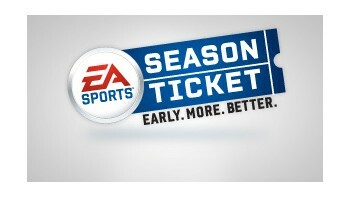 For more information, have a look at easports.com/seasonticket. UPDATE: As noted by Videogamer, Season Ticket is not currently available on the PS3 in Europe. "While we have not reached an agreement for the program with Sony Europe, we're pleased to be able to offer EA Sports Season Ticket for both PS3 and Xbox 360 in North America and Xbox 360 in Europe," EA said in a statement. No time frame for a European PS3 arrival was given.